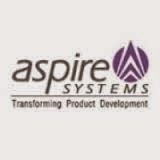 Aspire Systems is a global technology services firm serving as a trusted technology partner for our customers. We work with some of the world's most innovative enterprises and independent software vendors, helping them leverage technology and outsourcing in our specific areas of expertise.Aspire Systems is a fast-growing IT company, creating innovative products and providing services to clients globally. If the profile matches the above criteria, admit card would be sent along with the venue details to the candidates mail id on or before 9th October 2014. Interview process will be happening on 11th October 2014 (Saturday) so please make yourself available if you are eligible and interested for the same. Venue details will be mentioned in the admit card.